Eh bien, mes amis, Whata night! It is good to break your habits and --from time to time-- dive in the world of contemporary opera: they (a) defy your senses, and (b) help you not to become a routine opera consumer. This opera was composed in 2003 by an Austrian composer Wolfgang Mitterer (also an organist). It is loosely based on the play by Christopher Marlowe The Massacre at Paris. 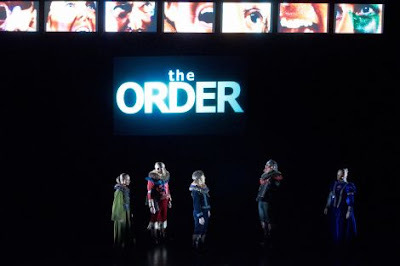 Although nominally related to the bleakest page in the French history (St. Bartholomew's Day massacre), the opera tells us about the tragic human attraction to crimes and atrocities. Many blurred images referring to the 20th century wars and to the recent ones in Middle East reinforce the composer's and director's intentions to make a more universal analysis. Mitterer says an interview that the score is sufficiently loose to leave each new production enough space to invent and revitalize his opera [that also means less security to the direction team, which often results in more passionate shows, if the director is inventive enough]. I must reiterate that the acoustics of the auditorium at the Cité de la Musique in Paris is impeccable, and the game with sounds that constitute this Mitterer's opera is particularly efficient when you're in the audience. The evening starts by drowning the public in a total darkness and one big screen beneath an array of 7 small screens starts with numbers and gray images. A small area on the stage is lit and a singing part may begin... The actors/singers show up for their singing parts in one of several episodes that are combined to make the opera flow. In front of them is a cameraman who slides on his small trolley and either his images are projected on the big screen, or the snapshots he takes are projected on the 7 small screens above. The effects the human voices make on you is extra-amazing probably because they are immersed in a peculiar musical texture which involves the orchestra, the electronic musics (included to produce new sounds!) and the sounds you get from the war-alarm, helicopters, burning wood... For that electronic part, the opera composer himself was in charge. Singing this opera must be particularly difficult because the sopranos --for example-- are jumping from gravi to the highest possible register and remain there like forever. The effect on the audience is fascinating and more than overwhelming. The opera is sung in English but it's sound that talk to you much more than the words ever could. I want to believe we were really lucky to have an excellent orchestra: Portuguese Remix Ensemble, known for their fine performances in contemporary genres that nontrivially encode jazz influences, and also for their interpretations of the musics by Schreker. They [3 string + 3 brass + piano + harpsichord/electric-piano + percussions] were conducted by Peter Rundel, an eclectic contemporary music expert too. All the singers were absolutely amazing and I feel like I would be unfair if I singled anyone out. 1 hour and 20 minutes of a welcoming shock-therapy.